Formalize the meaning of multiplication and division for algebra. Provide the first forum for students to effectively use reducing in an algebraic context. Introduces students for the first time to how simple algebra definitions (i.e. the definition of an exponent) can be used to prove a multitude of other cool rules that make doing math easier. In other words exponent rules formalize the structure of mathematical logic and proof for students. 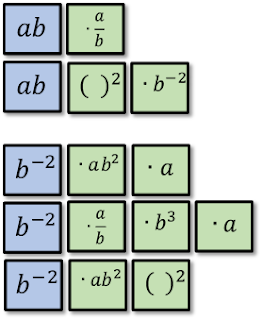 Is often the first time students see and manipulate algebraic rules represented purely with variables. If students can understand and use exponent rules, it prepares them for using and understanding other rules represented with abstract mathematical language. Set the foundation for a student's understanding of polynomial functions, radical functions, exponential functions, and logarithmic functions. Without a solid understanding of exponents and their properties students will struggle with all of these types of functions later. And I think we can teach the exponent rules well because they're just not that hard to derive, but the level of abstraction is what makes it difficult for students. So in teaching exponent rules, I believe we should focus on teaching students the abstraction, and the rules get learned along the way. That being said, I don't know how to do it but I keep trying. I've updated my lesson on developing the exponent rules. You can find that here and also, I've developed a simple game that I hope helps students cement the rules and learn to play with them. The game involves both strategy, luck and understanding of exponents so I think it's pretty good but it's only had a few trial runs. 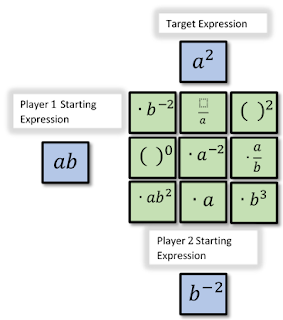 Object: Combine your starting expression with green cards to create the target expression. (1) You may use as many green cards as you wish. (3) If neither player can find the right cards to create the target expression, three more green cards can be put down. (4) Once the target expression is reached by a player, that player gets the blue card and all the green cards they used to make the winning expression. A new blue card is then put down and green cards are added until there are 9 green cards again. (5) Once all the green cards are gone, the game is ended and the player with the most green and blue cards wins. Here are several examples of how the players in the set-up above could reach the target expression. Love the thinking that must occur to win the game! I would also love an email copy since I could not access it via scribd. Thank you! PS I have spent several hours reading your blog and I appreciate the time/effort/energy you put into this blog!